According to a new poll by YouGov, the number of Americans who believe in evolution not directed by God is rising, but those pure evolutionists still only account for one in five of those surveyed. When YouGov asked the same question in 2004, only 13 per cent of Americans answered in the affirmative to the first statement. That number rose to 15 per cent in 2008, and its most recent findings, announced on Monday, saw that number rise to 21 per cent. For those who take a purely scientific view of evolution, that's the good news. 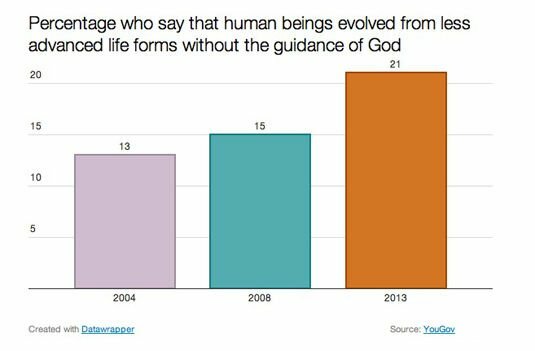 The bad news is that 25 per cent of all respondents said that God has guided evolution, and a full 37 percent dismiss human evolution entirely – meaning that 62 per cent believe that God is either guiding evolution or made us all as we are today at our moment of creation, which was within the past 10,000 years. You can, of course, look at those numbers in another way. As YouGov puts it, "The numbers show that 46 per cent of Americans believe in the evolution of humankind in some form, while 37 per cent of Americans deny this." 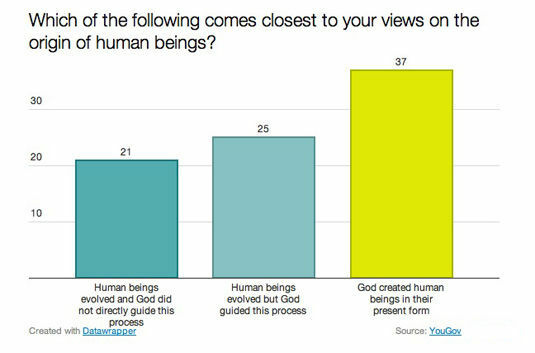 Only 5 per cent of Republicans believe God has had no impact on human creation or evolution, and a solid majority – 55 per cent – are of the opinion that He (and The Reg is willing to bet that most of them believe that He is, indeed, a He and not a She) created us as we are today. The highest percentage of those who believe that God made us as we are today was not to be found, as one might guess, among those 65 years old or older – 39 per cent – but instead among those 30 to 44 years old – 43 per cent. Men are more likely to believe in pure evolution than women, at 26 versus 17 per cent. Women, however, are more likely that men to have answered "Not sure," at 21 to 13 per cent. As might be guessed, atheists had the highest number of the "God had nothing to do with it" crowd at 87 per cent, but that percentage was matched by those who declared themselves to be Buddhists; 59 per cent of those who self-identified as Protestant – a wide range of beliefs, to be sure – said that we recent arrivals to planet Earth were placed here, as is, by God. 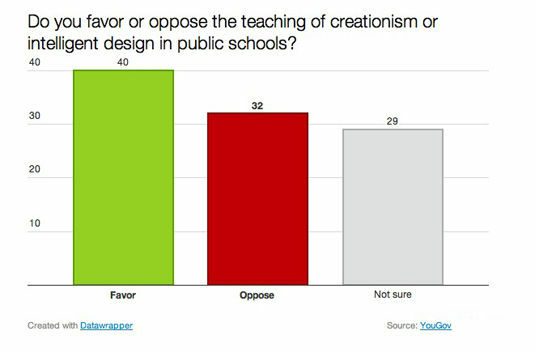 Finally, YouGov also asked its respondents, "Do you favor or oppose the teaching of creationism or intelligent design in public schools?" Overall, 40 per cent said that those alternatives to scientific evolution should be taught in public schools, 32 per cent opposed such teaching, and a full 29 per cent had no firm opinion on the matter. Among Mormons, 76 per cent wanted creationism or intelligent design added to the curriculum, as did 57 per cent of Republicans and 41 per cent of white folks. Weighing in against such teaching were 51 per cent of those with a post graduate education – the only educational group that topped one-half – and those Buddhists and atheists again, at 84 per cent and 83 per cent, respectively. Only 19 per cent of Republicans oppose such teaching; 41 per cent of Democrats do.